will dictate how low the bridge will need to be for good action. When a neck angle is too shallow it is common to find that after adjusting the bridge and saddles as low as possible the string height remains too high. An electric guitar's neck angle may require adjustment if satisfactory string height can not be achieved after a proper set up. My bridge and saddles are as low as they can go and the strings are still too high from the frets. Neck angle and neck relief are two entirely different things though both affect string height. Neck Angle is the pitch (angle) at which the neck is set in the body and requires neck removal to change. Neck Relief is the amount of curvature (bow/relief) in the neck itself and is controlled by the truss rod. A neck with excessive upward bow (relief) could present similar symptoms if not properly adjusted. To check your necks relief, see my article on truss rods. The original factory angle was less than perfect from the start. Large factories use computer controlled carving equipment to route neck pockets and carve necks, this equipment is frequently calibrated to insure consistency. When replacing the bridge on an electric guitar it is vital that the replacement be of suitable height/thickness. A taller (or shorter) bridge may require an adjustment to the neck angle. When mixing a body and neck from two different manufactures one may find that the neck angle must be adjusted to accommodate for any differences in neck pocket or heel specs. Neck angle is easily adjusted on instruments with a bolt on neck, such as a Fender Stratocaster. Once the neck is removed from the pocket, a shim is used to control the pitch of the neck. Shimming the pocket at the very end of the heel will tilt the neck back, increasing the neck's angle over the bridge and consequently lowering the strings. On electric guitars that have their necks glued in place, such as a Gibson Les Paul, changing the neck's angle is a matter of steaming the neck off and doing a neck reset. Though the pockets may vary, the concept is similar to an acoustic neck set. Obviously this is an expensive repair. Fender's Micro Tilt necks provide an easy mechanism for adjusting the neck's angle. 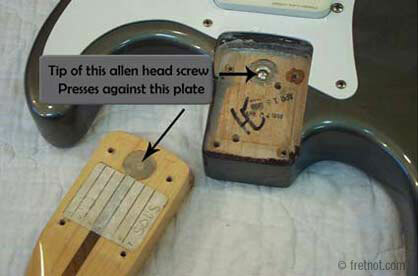 Accessible thru a small hole in the neck plate, an allen head screw can be used to increase the neck's angle. When tightening this screw, it protrudes past the surface of the neck pocket and pushes the bottom of the heel up, increasing the neck angle. On Fender's 3 bolt neck design with Micro Tilt, the bottom neck mounting screw passes thru the plate but adjust in the same fashion. 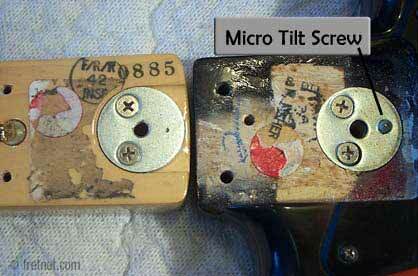 Prior to tightening the Micro-Tilt adjustment screw, the neck mounting screws should be loosened enough to permit the neck to move. When removing angle and loosening the adjustment screw, be sure to snug up the neck mounting bolts.